Dry fruit, vegetables, and jerky in hours instead of days. The unit's patented Converga-Flow drying system forces air down the exterior pressurized chamber, then horizontally across each individual tray, converging in the center, for fast, even, and nutritious drying. Flavors don't mix, and there's no need to rotate the trays. It's top-mounted fan eliminates the worry of liquids dripping into the heater chamber, and an opaque Vita-Save exterior helps block harmful lights in order to retain more of the food's nutrients and vitamins during the drying process. The unit's adjustable thermostat ranged from 95 degrees to 160 degrees F, providing the flexibility needed to ensure excellent results. It's a 600 watts unit. Five trays come included, but the unit can be expanded to 12 trays (additional trays sold separately) for drying larger quantities at one time. Accessories include two fruit roll sheets, perfect for drying semi-liquids like soups, sauces, and fruit rolls; two Clean-A-Screen flexible screens, which allow for easy drying of small items such as herbs, spices and potpourri; and three original jerky spice packets for making jerky. A 52-page recipe and instruction book also comes included. With a speckled gray design, the food dehydrator measures approximately 13-inch by 13-inch by 10-inch. FD-75A is Frustration free packaging and FD-75PR is retail packaging. FAST, EASY WAY TO MAKE DELICIOUS AND HEALTHY NATURAL SNACKS. 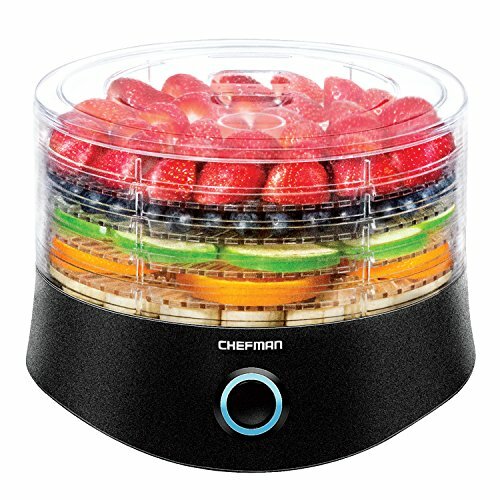 With the Chefman Round Food Dehydrator, you can easily make jerky, fruit rolls, veggie chips all delicious, and without any preservatives. For those who love dehydrated treats but hate the hassle, this easy-to-operate auto-dehydrator is the perfect treat simply slice, season, and snack on something deliciously healthy. Great for making homemade granola bars, trail mix, beef jerky, dried herbs, fruit snacks, and more! Additionally, Club Chefman is loaded with cool recipes including, meats, desserts & more! One-touch operation is easy to use, while transparent trays and lid make it easy to view the process of your dehydration. As easy to clean as it is to use, the removable trays are dishwasher safe. Making delicious dehydrated delights has never been so easy! CONSISTENT RESULTS: Superior air flow for even and consistent drying, every time. Great for making homemade granola bars, trail mix, beef jerky, dried herbs, fruit snacks, and more! RESOURCES & WARRANTY: Includes access to Club Chefman for tailor made step-by-step recipes, tutorial videos, and more! cETL approved with advanced safety technology for long lasting durability, & 1-year hassle-free warranty provided by Chefman, so you can purchase worry-free - we've got your back! 280 watts and compatible with 120 volt outlets. Got the munchies? Indulge without ditching the diet.. or your money! With the Gourmia GFD1650 Food Dehydrator, you can forget about store bought processed junk. Now you can make a more flavorful, nutrient dense, preservative free, and much cheaper alternative to packaged products. Dry up a huge variety of delicious, healthy snacks; from sweet pineapple slices to chewy beef jerky- at a fraction of the commercial costs! Comes equipped with six trays so you have ample room to get creative. Load the trays up with your favorite fruits, veggies, herbs or meat; set to your preferred precise digital time and temp and enjoy your fresh yummy snack! We ve included a free recipe book with inspiration for different food dehydrating ideas like Maple Chili Beef Jerky, Cheesy Kale Chips, and Raspberry Mango Fruit Leather! Gourmia s mission is to make everyday cooking easy, healthy, and delicious. Our products deliver a higher standard of innovation, performance, and value. Our founders are experts in the modern world of small appliances and are passionate about providing our customers with dependable, efficient tools that will make life in the kitchen fun and easy. 6 TRAY: Six trays provide plenty of room to get creative drying anything from sweet pineapple slices to sticky dates and even chewy beef jerky! Also comes with a bonus fruit leather sheet and drip tray. 360 CIRCULATION: Simple, precise, digital controls activate 360 airflow circulation for thorough uniform drying without overheating- no rotation required. TRANSPARENT DOOR: Door is clear for easy at a glance monitoring of all sheets. FRESH & HEALTHY: Forget store bought processed junk. Now you can make a more flavorful, nutrient dense, preservative/additive free, and much much cheaper alternative to commercial products. ETL CERTIFIED: We, at Gourmia, take the quality of our products seriously. This product is ETL certified and BPA free, so you can be confident that you're receiving a safe, efficient, high quality appliance. FAST, EASY WAY TO MAKE DELICIOUS AND HEALTHY NATURAL SNACKS. With the Chefman 6 Tray Touch Screen Food Dehydrator, you can easily make jerky, fruit rolls, veggie chips all delicious, and without any preservatives. It s great if you re in charge of snacks in your household, are a health-conscious eater or simply love knowing exactly what s in your food. For those who love dehydrated treats but hate the hassle, this easy-to-operate auto-dehydrator is the perfect treat simply slice, season, and snack on something deliciously healthy. 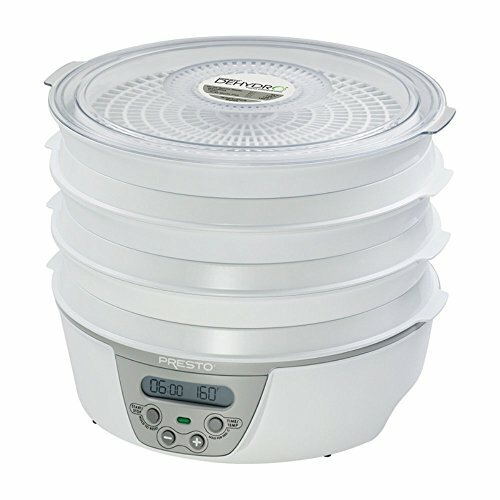 Digital temperatures preset settings ranging from 95 F to 158 F, integrated with a countdown timer up to 19.5 hours, provides accurate drying times and temperatures to make it super easy for you to start creating delicious dried fruit, homemade granola bars, trail mix, beef jerky, dried herbs, fruit snacks, and more! The transparent viewing window allows you to keep an eye on your food as it dehydrates without opening the door. As easy to clean as it is to use, the removable trays are dishwasher safe. Making delicious dehydrated delights has never been so easy! Trying to cut down on food waste? Dehydrate stale snacks like crackers and cereal to give them brand new texture and crunch. Get as creative as you want and use the dehydrator to dry flowers for potpourri, make edible cake decorations or garnish for cocktails. DEHYDRATING SIMPLIFIED: The Chefman dehydrator includes 6 spacious (13"x12") adjustable BPA free plastic trays, so you can create different types of dehydrated foods in one convenient batch at a fraction of the cost of commercially dried foods. Makes for a great healthy snack and ideal for people with allergies as there are no preservatives! DIGITAL TOUCH SETTINGS: Digital temperatures preset settings ranging from 95 F to 158 F, integrated with a countdown timer up to 19.5 hours, provides accurate drying times and temperatures to make it super easy for you to start creating delicious dried fruit, herbs, meat or yogurt! 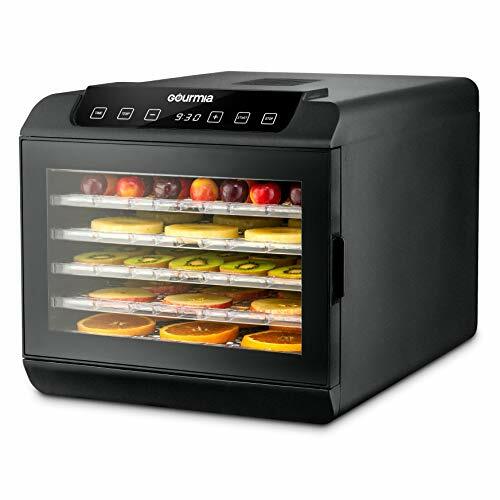 CONSISTENT RESULTS: The Chefman 480W Food Dehydrator has a built in innovated design that maximizes airflow that results in an even drying without overheating ensuring the perfect dried fruit slices, long-lasting dried herbs, delicious beef jerky and more! 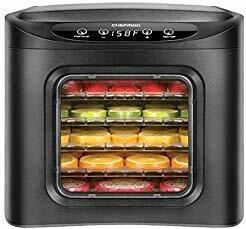 You can even use this dehydrator when making your own pasta or use it to freshen up stale cookies or crackers! EASY TO MONITOR: The process of drying can be observed without opening the door, designed with a clear door that allows you to monitor the progress of drying meat beef jerky, fruit slices, sweet potato and vegetables, or any other dried food snack. Introducing the Snackmaster Express All-In-One Kit. 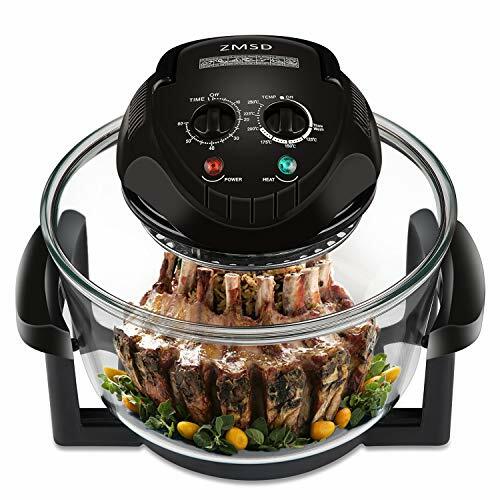 It's sleek, contemporary design features 500 watts of drying power, and generates maximum speed and quality for dehydrating fruits, vegetables, beef jerky, and venison jerky. Helps dry food in hours, not days like ordinary food dehydrators. The top mounted fan eliminates the worry of liquids dripping into the the heating chamber! It contains everything needed to dry all types of food including top mounted fan, 5 trays, 5 jerky spices and cures, a jerky gun with 3 tips, 2 Fruit Roll Sheets, 2 Clean-A-Screens, and a recipe book/care use guide. Dehydrator Color: Speckled Grey. Looking for snack options that are high in nutrients but low in calories? Want to offer your family delicious food options to dress up morning oatmeal or replace that bag of potato chips at lunch? The Hamilton Beach Food Dehydrator helps accomplish these goals by taking food preparation to the next level. It opens the door to endless possibilities deemed too difficult to do in the past. 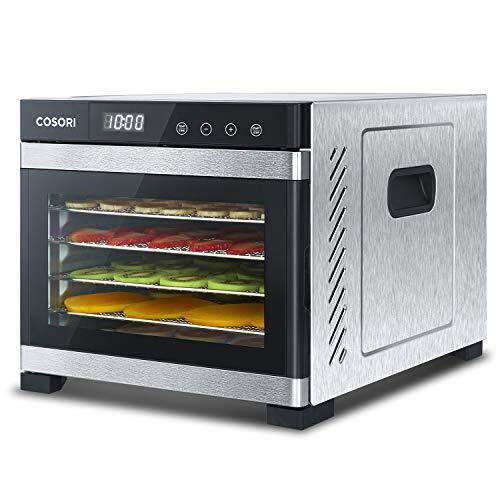 With five stackable drying trays and 500 watts of power, it's easy to dry a variety of fruits and vegetables and even make beef jerky. The continuous airflow feature provides even drying, eliminating the need to rotate trays. This dehydrator includes an adjustable thermometer for better performance and a timer with automatic shutoff. A food dehydrator lets you to make healthy foods at home like crunchy green beans or dried sweet potato sticks. Have a sweet tooth? Banana chips or dried apples with cinnamon are the perfect fix. And since the fruits are not bogged down with additives or preservatives, their natural sweetness shines. 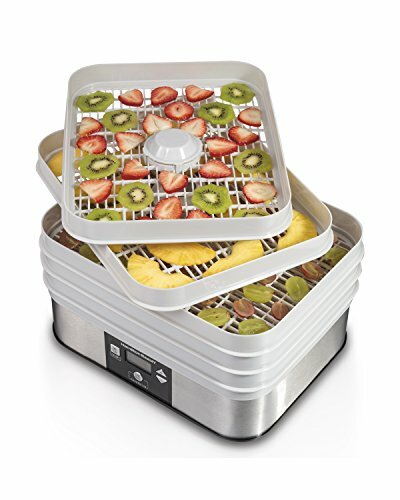 The Hamilton Beach Food Dehydrator comes with two specialty sheets for added versatility. Use the mesh sheet to dry garden herbs for year-round enjoyment, or puree summer fruits and spread on the solid sheet for homemade fruit rolls. Wholesome, home-made snacks for the entire family. Now that's Good Thinking. TIP:Post treatment of meat after dehydrating may result in a more desirable jerky texture. Try each treatment to determine which jerky you like best. An easy way to make homemade jerky and additive-free fruit chips. Your Presto 06301 Dehydro Digital Electric Food Dehydrator dries fruits and veggies naturally and comes with a sample packet of jerky spice and cure. 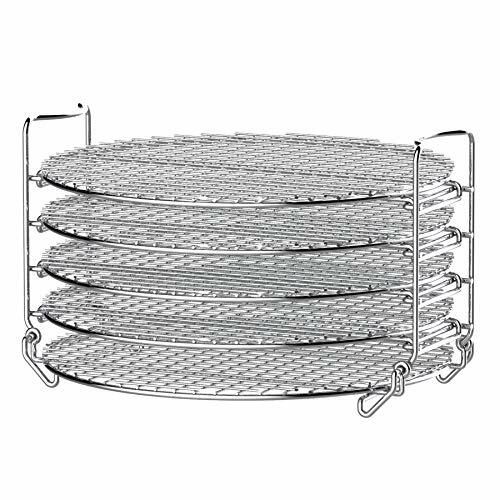 Its six-tray system includes two nonstick screens for smaller or sticky foods. It's easy to use, clean, and store. You even get a clear lid to monitor your progress easily. About Presto National Presto Industries Inc., was founded in Eau Claire, Wis., in 1905 as Northwestern Steel and Iron Works, maker of industrial-size pressure canners for commercial canneries. Ten years later, it began manufacturing large pressure canners for home use. In 1939, the company introduced the first saucepan-style pressure cooker and gave it the trade name ''Presto.'' Since then, the company has expanded its product line to include a wide variety of popular cooking gadgets, including electric griddles, pressure cookers, pizza ovens, deep fryers, and more. Dehydrates fruits and vegetables. Includes 6 drying trays in white. Comes with bottom-mounted fan and heating element. Features digital thermostat and timer. Dimensions: 15L x 7.25W x 14.5H inches. Designed in California. Check out our VIDEO on the left side & take a quick tour of this COSORI round food dehydrator machine! EASY TO USE - Use the digital control panel to set the timer in 30-minute increments for up to 48 hours. Effectively dehydrate food with accurate temperatures between 95 -165 F. Comes with Mesh Screen & Fruit Roll Sheet. VARIOUS CHOICES - Dehydrating foods such as fruits and vegetables effectively treats any bacteria that are typically found in moisture. Use the included recipe book, mesh screen, and fruit roll sheet to easily make delicious snacks at home! 50 RECIPES COOKBOOK - Enjoy your favorite dried foods with 50 fresh ideas from COSORI chefs. Find out how our influencers dried their food with Cosori food dehydrator on social medias, also recipes and videos tutorials from our community! SAFE TO USE - ETL & FDA Certified. BPA-free. Auto Shut-off prevents food from overcooking and the dehydrator from overheating so you can run it night and day. EASY TO STORE & CLEAN - The 5 trays and included accessories are BPA-free and dishwasher-safe. 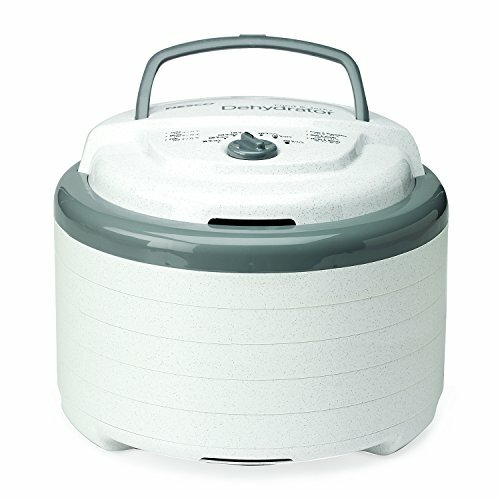 Easily clean food from the dehydrator's base with a damp cloth or a brush/sponge. Stack all 5 trays to dry more food and save space and it is also lightweight and easy to store. 2-YEAR WARRANTY FOR FREE - Comes with a 90-day money-back guarantee. also 2-year warranty and lifetime support from Cosori. Just contact Cosori customer service if any issues happened. 100% satisfaction guaranteed. With five stackable layers, we see lots of snacks in your future. Dehydrate fruits and meats, or make crispy kale and vegetable chips. 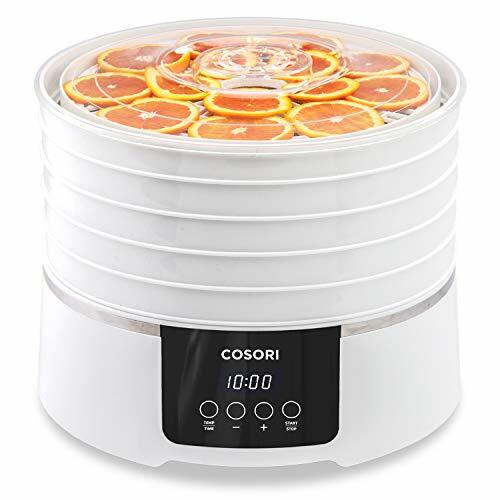 The COSORI food Dehydrator Dries Food by effectively circulating hot air. As the hot air removes the moisture in food such as fruit and vegetables, The bacteria/fungi that are often present in that moisture are simultaneously taken care of less food spoiled and fewer health risks! FREE RECIPE BOOK - Comes with an original recipe book from Cosori's chefs with 50 easy-to-make recipes. Follow the simple instructions, and you'll be well on your way to delicious snacking! ZMSD Air Fryer uses the latest technology and works faster and more efficiently than traditional convection ovens. ZMSD's halogen cooking convection oven is powerfully suited to a wide range of foods and is popular with consumers. It can be used for reheating, grilling, baking, baking, etc. of the residue. Small in size, but the food can satisfy the whole family. It has 1400 watts of high-power heating elements. ZMSD's patented and efficient design process continues to win the highest level of user satisfaction. 2.Laboratory Tested to Prepare Healthier Meals, Quicker! 6.Power Cord Length: 3.3' Ft. Powerful Functions The Convection Oven has the ability to defrost, broil, roast, bake, steam, grill, and BBQ Perfect for chicken, steak, ribs, fish, shrimp French Fries & Chips and more. No need to preheat or defrost frozen meat for the best flavor and taste. Health and Safety All use high-quality environmentally friendly materials, non-toxic and harmless to the human body, high temperature and high temperature resistance, triangle plugs have grounding protection, Don't worry about the risk of electric shock. The entire cooking process does not produce soot and protects the health of the family. The Best Choice The Transparent glass bowl is designed to let you see the progress of your food without the need to open the cooking chamber & the heat escape - for a much faster experience moderate size, to meet the entire family cooking, without taking up a lot of space It is also a great gift for friends.